We hope to charter a Thames Passenger Steamer for an SBA outing sailing from Rynnymede or Windsor for an afternoon cruise at a cost of around £40 per person depending on numbers. Date to be confirmed during August or September. Please contact Richard Havard as soon as possible for more information and to register your interest. A date will then be arranged to suit as many interested members as possible. Full programme and booking form now published - see the event page. Phew! The upgrade worked, now we will be able to add new features. 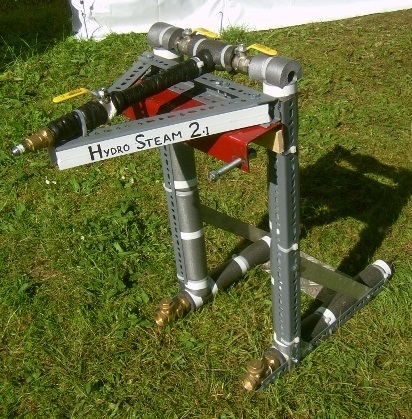 Sorry you couldn't get onto the site today - but it was a great day to have been steaming! The SBA website will not be available on Saturday June 21st. System maintenance will start at 7am UK time and last up to 10 hours. Apologies in advance - why not take the day off to go steaming? We hope to charter a Thames Passenger Steamer for an SBA outing from Windsor, or near by, if enough members are interested. If you would like to be kept informed on date and cost please e mail Richard Havard who is organising this outing. At this stage it is not known if enough members are interested and until we know numbers we can’t talk with the steamer operators about costs, dates and venue. 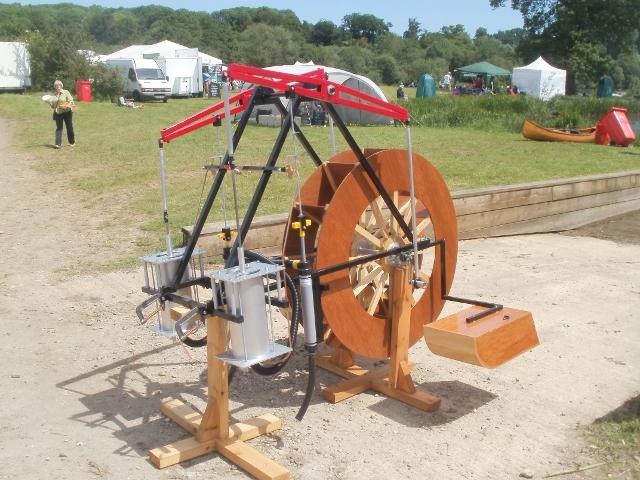 The entries for the first ever Steam Outboard Motor Challenge are described below. This event was highly entertaining and warm thanks must go to Kingsley Robinson, whose idea it was, and to all who built entries and ran them at Beale Park. The Host Boat, providing steam from its kerosene-fired boiler, was Chimera II. David Avery was all set to change the face of steamboating as we know it. What he made was a neat arrangement of pipes and ball valves, the idea being to gain propulsion by means water ejection. Steam lifted the water from the lake ( in theory) and pushed it out of the ejector tubes to thrust the host boat at high speed across the water. Using a fair bit of Chimera II's kerosene to produce as much steam as possible, it emitted an interesting bubbly farting sound and projected the boat approximately 28mm. 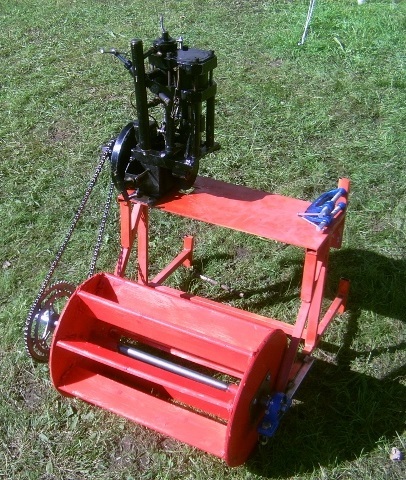 John Barnard's entry had a strong whiff of Briggs & Stratton about it and his conversion of a 4 stroke lawn mower engine was as elegant as it was effective. 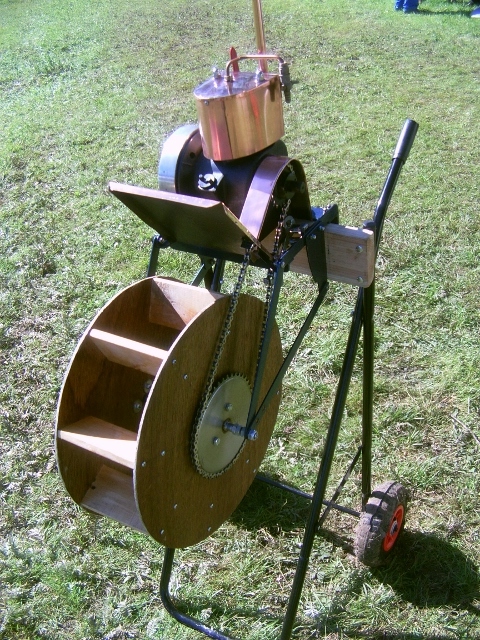 This nifty engine used the original engine valves simply with a much altered camshaft. Linked to a plywood paddle made of old bookshelves this creation pushed Chimera II manfully across the lake showering everything and everybody in a wild deluge. It was impressive and cost just £17 to build. John Winn had remorselessly confiscated a neat vertical single from the workshop of a friend in Didcot who shall remain nameless unless you read further. Mounted on a Seagull leg and gearbox it put up a fight initially by breaking its piston rod. John burned a candle until the wee hours back home in his workshop and the restored engine put up a very creditable run on the last day. A look at the pictures shows that Chimera II was ballasted for this run with some of the SBA's serious heavyweights (names like Rudall and Schofield stand as charged) and had some of that excess lard been shed, or used for lubrication, John is pretty sure his entry would have skimmed effortlessly across the lake and blown away all competition. 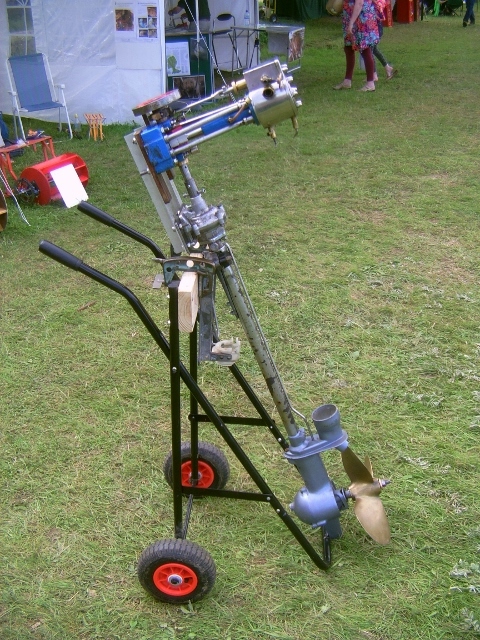 John Schofield's creation was powered by another small vertical engine and this was the only entry with the potential to go backwards if desired. But to have gone forwards would have been an impressive advantage. Thus all the technical innovation was immaterial since drive to the wooden paddle was by bicycle sprocket and chain and the thing had no desire to hang on to its chain for any worthwhile length of time. A credit to the mighty workshop facilities that built Magic Dragon it was a frightening machine and an affront to the H&E executive, but it showed promised for a few microseconds before disintegrating entertainingly and lapsing into sullen non-cooperation. Mike Robinson presented what was most certainly the most imposing and technically awesome entry. It was twin-beam atmospheric - i.e Newcomen - paddle engine. It was beautifully and extremely elegantly engineered, the massed expertise of Robinsons in Wales and Sheffield having been pressed into production of components, including exquisitely neat floats to enable it to be anchored to the transom board of the host boat and supported at its other end by the water itself. This monster had two runs, the first using direct condensing water injection into the cylinders resulting in hydraulic lock-up and a fearfully bent piston rod on one side. This was repaired and condensing water on the next run was squirted on the outside of the cylinders, with the help of skillfully wielded of plastic cups. It looked fantastic, was enormous fun, the audiences loved it, and we can report with some pride that it did make a revolution or two under its own power. To overhear the development team discussing technical moves had all the intensity of a F1 team discussing how they might extract a further 0.3 of a BHP out of a highly-stressed racing engine. On reflection to be able to get as much as 0.3 of a BHP out of Newcomen's 18th century mine pumping technology would have been impressive. This engine was though, as aforesaid, an awesome beast and we hope to see it again! Ian McAlpine, though, deserved to be declared the winner. There are not many forms of steam engine left untried or unmade by Ian and his four-cylinder cruciform engine had poppet valves and went like a rocket. He disdained mounting a steam engine on the remains of a superannuated Seagull, and made his own leg, bottom end gearbox and prop. 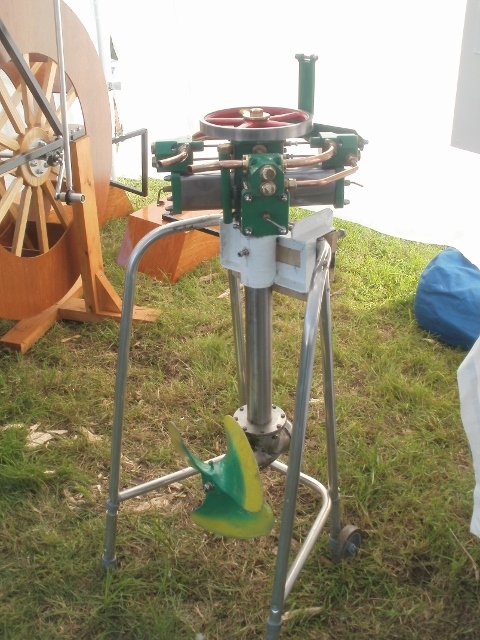 He even polished his steampipes and arrived at Beale Park with this machine neatly affixed to a Zimmer walking frame which in some subtle way conveyed a message to the many SBA members present. No doubt some old person in the Didcot area had to spend the entire weekend unable to get up to go the loo, but they can be assured it was all worth it. The engine ran as impressively as it looked. 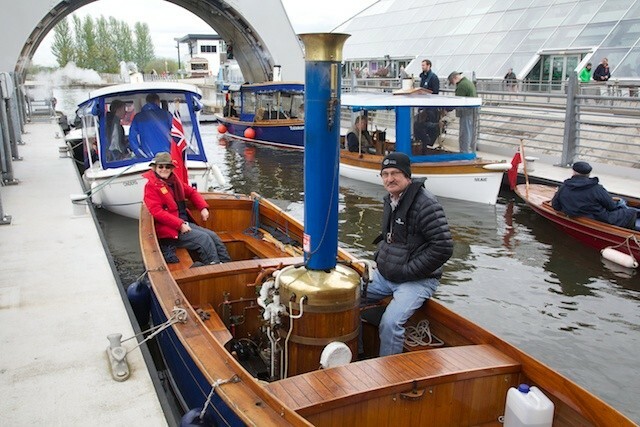 Scottish and North Western Members enjoyed a memorable weekend cruise up the Falkirk Wheel and on the Union Canal to Linlithgow on the 2nd and 3rd of May. A professional photographer, Nils Härtel, joined the trip and you can see his album of pictures here. It is with great pleasure that I can announce that the new interactive Steamboat Register is now officially ‘live’. Some of the more sharp eyed of you have already noticed that we have been doing some advance beta testing and have already been having a go – thanks for the feedback. For the rest that have been waiting patiently (well most of you have been patient!) for this moment you can now hit the keyboard and update your boat details. The new system works in ‘real time’ (which means that things go live as soon as you press the keys on your keyboard); therefore no more waiting for updates to filter through the system - YOU are in immediate control. Please note that the username and password that you need to access the Register are NOT the same as your SBA website username/password – this is partly for technical reasons and partly for security reasons. There is an instructional video on the Index page of the new Register which should point you in the right direction. Those of you who have a boat that was already in the ‘old’ Register should have had its details migrated across to the new Register and so, as long as your email address is correct, you can get your username/password emailed to you by clicking on ‘Help, I own a steamboat in the register but don’t know my log in details’ on the login page. If you didn’t have your boat in the old Register you can easily create a new username/password from scratch on the same login page. If you have any problems please email me and I will assist you in getting ‘Registered’. This is the culmination of many man-hours of work behind the scenes over the last year or more and is a very great milestone in the Register’s history for which our immeasurable gratitude for making it all happen must be extended to our resident software guru: Kingsley Robinson.